Ingrid Anderson saw that expats and tourists on the southern Pacific coast of Costa Rica needed a place to be pampered, primped, and peeled. Starting a successful business overseas is much like starting a business in your home country: Find a need and fill it. California native Ingrid Anderson, 41, saw that expats and tourists on the southern Pacific coast of Costa Rica, in the beach community of Uvita, needed a spa and salon—a place to be pampered, primped, and peeled. She was right. Since opening in September 2012 the appointment book for Mia Bella Spa and Boutique fills up regularly with clients seeking a massage, body waxing, eyebrow tinting, make up, spray tanning, facials (including microdermabrasion and chemical peels), as well as chiropractic care. Ingrid works alone in the spa, but brings in a professional masseuse for massage clients and a chiropractor for those services as needed. With 17 years as an esthetician with her own spa and makeup artist for event and swimsuit photo shoots in the U.S., she’s well suited to her new role here. And even though she charges half or less of what a similar spa in the U.S. would charge ($60 for a full 60-minute facial versus $125+ back home), Ingrid has nearly recouped her $10,000 initial investment just six months after opening. “Every month is different. Sometimes I only make $1,200 and other months $2,000 to $2,500. Overall, we’ve done really well,” says Ingrid. “But you don’t come to Costa Rica to make a killing. You come to enjoy the lifestyle. 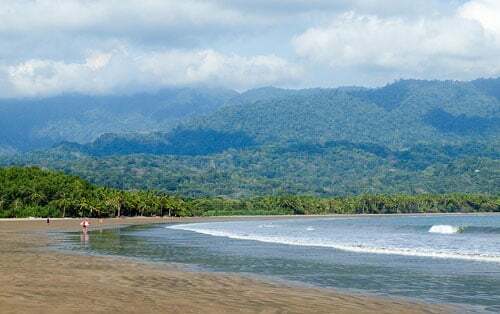 The region where Ingrid lives, also known as the Southern Zone, runs roughly from the surfer town of Dominical south to the Panamanian border. It’s graced with the natural beauty of green mountains dropping dramatically to the Pacific; wild, deserted beaches; steamy jungles filled with toucans and monkeys; world-class surf; and jawdropping sunsets. And while it has plenty of surf shops, hardware stores, grocery stores, and other “practical” places to shop, it was seriously lacking in the pampering and beauty treatment department before Ingrid came along. With better access to the region thanks to the completion of a coastal highway in 2010, a growing numbers of expats call the Southern Zone home. These days, with luxury homes dotting the hills up and down the coast, many aren’t the rough and ready type. And they’re hoping for some comforts from home they are used to. The clients at Mia Bella Spa and Boutique are mostly expat women, although Ingrid does get some Ticas, as Costa Ricans call themselves. The salon hours fit Ingrid’s pura vida lifestyle—9 a.m. to 4 p.m. Wednesday to Saturday. She takes walk-ins but most of her work is done by appointment. Many of her clients already have a favorite treatment. “The ‘Signature Facial’ is the most popular because it includes microdermabrasion, vitamin C or pumpkin enzyme, as well as an upper body and hand massage. Sometimes we add oxygen for an extra fee,” explains Ingrid. Another great source of customers has been local hotels. Accommodations here tend to be smaller scale, without on-site spas, so Ingrid has gotten to know the managers and staff at local boutique hotels, B&Bs, and ecolodges. She leaves brochures in the reception area so when a guest asks where they can get beauty treatments, they send them to Ingrid. “It’s nice to be hiking in the jungle or out surfing all week. But then you go and get a facial on Saturday.” She also has a team that will go to hotel to do treatments. Word of mouth and an ad in the local phonebook and expat magazine have also brought in business. While the spa has taken off well, it was actually a long time in the making. Ingrid and her husband, Robert had owned a house in the area for six years and were frequent visitors. They made the decision to make a permanent move to the area about a year ago, after their oldest daughter graduated from high school. Their youngest daughter is with them. She also spends plenty of time on the beach—she’s a fan of stand-up paddle boarding. Personal fitness and martial arts are her passions as well and the focus of another business in town, a gym, which she runs with her husband. Her start-up process for the spa included refurbishing the interior of the shop and building a separate cabin with air conditioning. She was able to use some equipment from her old shop in the States in her new location, but brought things like natural skincare products and cosmetics. Instead of shipping supplies down, she chose the cheaper option of paying an extra baggage fee ($40 per piece on Taca Airlines) to bring a new microdermabrasion and facial machine, a massage table, airbrush tanning machine, and three waxing stations. Her rent is just $300 a month on a three-year lease; a steal compared to rents in Los Angeles. “In a nice area you would pay thousands for the same type of space,” says Ingrid, who adds that her electric bill is just $75 a month. There have been challenges though. Getting supplies can be difficult, especially for the natural products Ingrid offers, but she’s recently found local suppliers for things like castile soap (a chemical free product) and organic coconut oil (for massage). She’s also started selling jewelry from a local expat artist. On an upcoming trip back to the U.S. she plans to spend about $2,000 to buy more all-natural products (her first run sold out quickly).